IBM made this service a while back that "applies linguistic analytics and personality theory to infer attributes from a person's unstructured text". What does that mean? Basically, you can give the service a writing sample of about 6000 words (which admittedly is a lot), and it'll return a full personality profile of the person who wrote it. Instantly! Before in order to get a personality profile of someone, a dude would have to make them spend 10 minutes or so completing a really boring survey. Now I can profile hundreds of people in just a few seconds with really little effort on their part. Including you! Why should anyone care? 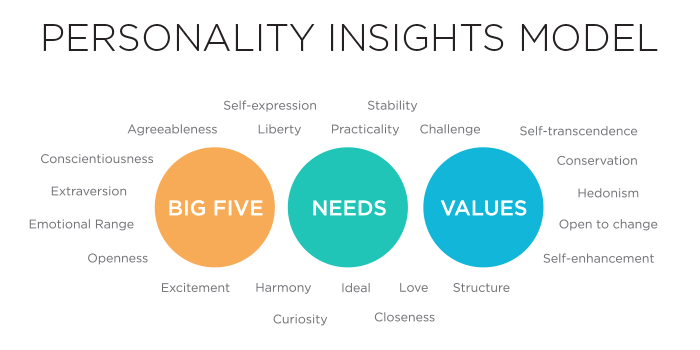 Personality profiles are really powerful; they do a good job of summing a person up. They predict a broad variety of life outcomes - stuff like life expectancy, music preferences, personal relationships, religion. They're really useful for understanding ourselves and understanding others. I don't think there's an area of psychology as rich in information as personality research, and it gets bigger and bigger every day. IBM's profiling service lets us tap into this sort of insight easily and quickly. This thread is about finding as many cool ways as possible to do just that. Still, I'm starting off with a few more specific objectives that should be of interest to the community. I can give you insight into who you are! I can tell you how to be popular! Stuff like that. They are laid out over the next few posts. Last edited by Psyche on Mon Jun 27, 2016 5:34 am, edited 4 times in total. Ask and depending on your call I'll either post here (default) or pm you an individual personality profile just for you. This explains some how to interpret your results. Ask questions if you still don't get it! The demo I linked to at the start of the thread might suffice for you, and it'll give you this spiel about your personality that I won't. Still, there are a few reasons you might wanna use me. First, 6000 words is a lot! For reference, I recently wrote a 35 page paper as part of a capstone project for my school. My 6000th word in that paper happened on page 22. Finding 6000 of your own words that aren't part of some academic paper or your personal fanfiction archive can be difficult. I've made a program that automatically extracts the 6000 most recent words you've posted here on the forum and makes a profile from that so that you don't have to worry. Why, I might have already generated a profile just for you (and for me). Maybe more importantly, though, a profile from me might be more informative than what you'll get using the demo. I can tell how you compare to other people on this forum. For example, Drench scored higher on Cautiousness and Trust than anyone else in the recent SUPP. I can't make this stuff up. I can also offer you sampling errors for your traits and maybe some other things. The public profiles I've made so far are here. You all get your own personal figures outlining your traits as measured by the service. This is a major update, so maybe check the folder again if you haven't in a while! If you scroll around you'll see also present a spreadsheet containing every consented person's average scores as well as their scores ranked relative to everyone else in the community profiled so far. If your profile isn't present and you're not listed here I've forgotten about you. Last edited by Psyche on Tue Jun 28, 2016 1:16 am, edited 11 times in total. I did an informal study comparing popularity within our community with the different personality traits that IBM's service measures. Where the data came from. The recent Speakeasy User Popularity Poll (SUPP) gave me data on different users' popularity here. 146 people were evaluated by 92 people on a scale from 0-10 (0 is "I absolutely LOATHE this user! "; 10 is "I absolutely ADORE this user!") and participants were later ranked by their average score. The standard deviations of these means were reported, too, along with the number of 0s and 10s each user was given. To measure personality traits, I obtained the 6000 most recent words that each evaluated person has made on the site and put them through the service. This partially explains why I made this decision, but please understand that my main reason is that it was really convenient. Anyway, the service returned for each SUPPicipant over 50 different measurements based on these writing samples. A composite profile. Let's start with the big picture. I took everyone's personality profiles and averaged their percentile scores. The result is a measure of which traits are prominent in our community relative to the general population. Since these are percentiles, the line at .50 refers to the average 'trait score' in the general population. So according to IBM the generated profiles were high in Depression and Anger and low in Self-discipline and Artistic interests relative to the typical profile. 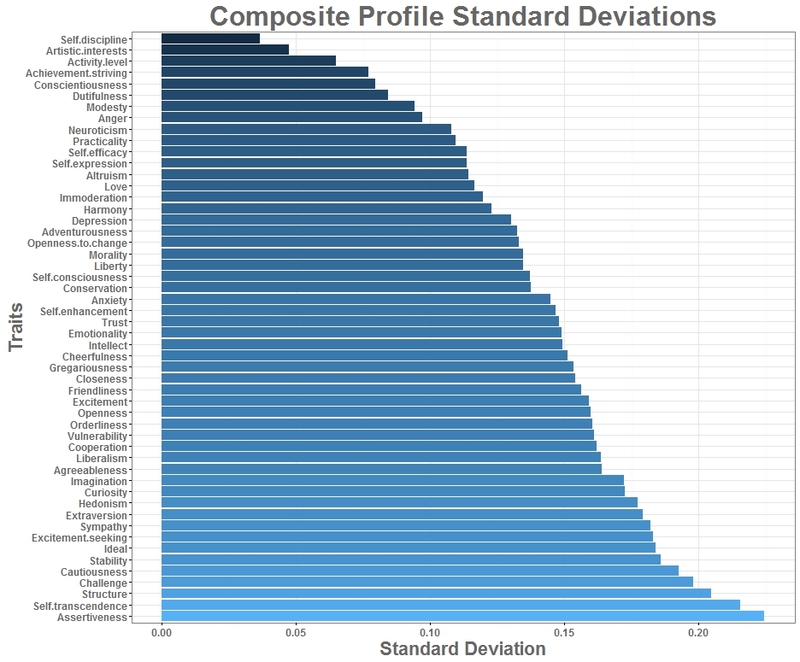 A one-sample t-test (mu=.5) comparing the Speakeasy and general profiles found p-values below .05 for every trait measured except for Excitement, Emotionality and Hedonism. I'll leave discussion of these and other results to the thread. Find the full figure here. This figure is like the other figure except it's about the standard deviation of traits rather than their actual scores. Spread matters, too, right? Get some help interpreting the "meaning" of each trait here. Correlations with popularity. 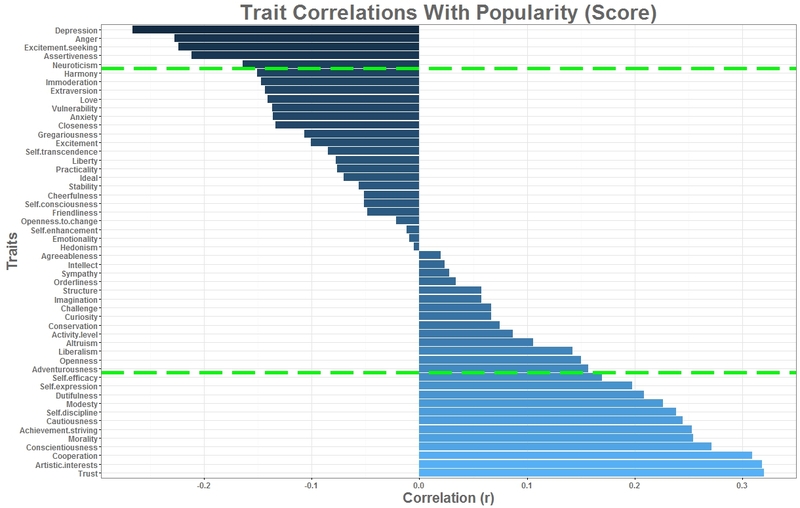 Now, the easiest question we can ask with our personality and popularity data is how each trait relates with popularity here in our community. 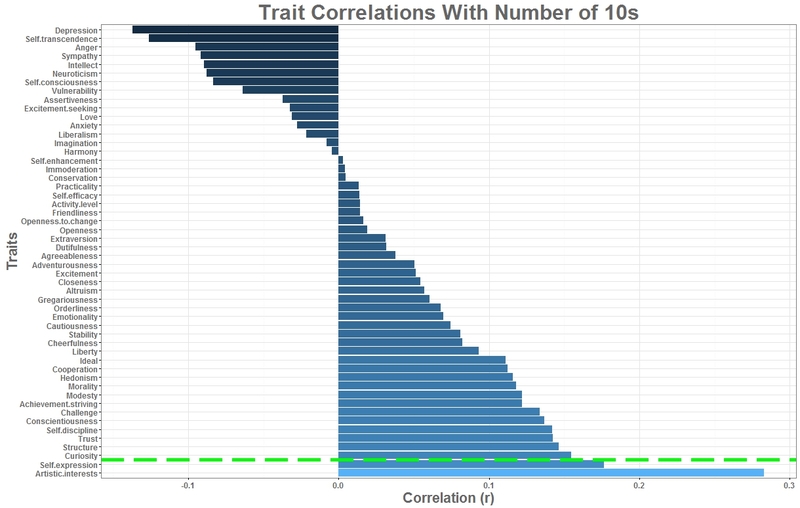 I computed the correlation of every trait with the SUPP's rankings, average scores, counts of 0s and counts of 10s. Furthermore, each correlation was t-tested for significance. 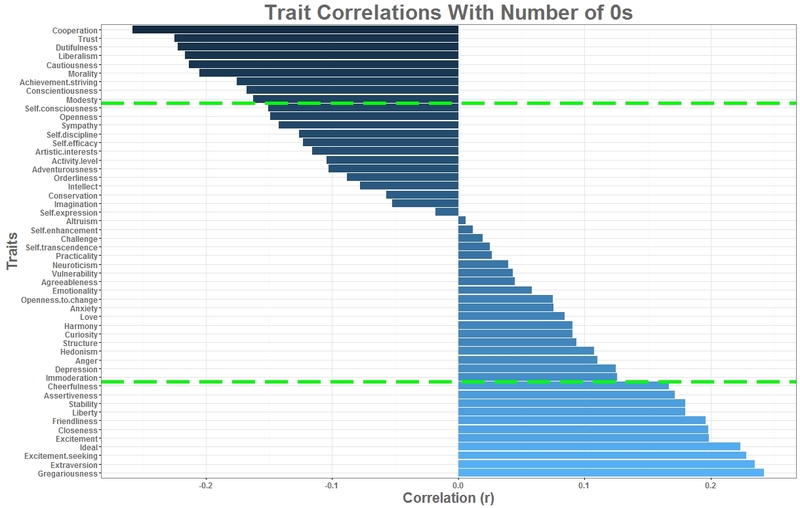 In my produced figures a horizontal green line indicates significance: traits outside of the rectangle outlined by the dotted lines (ie either above or below) correlated significantly with the popularity measure, p<.05. So for example Conscientiousness and Depression correlates significantly with average scores but not Practicality or Curiosity. If I were you I'd focus on the average scores chart because the rankings one is shamefully misleading. Get some help interpreting the "meaning" of each trait here. Distinctiveness versus representativeness. Let's get a little abstract. If one wants, one can pose two competing hypotheses about how popularity happens. The representativeness hypothesis is that popular people are representative of their communities. Some of their traits might stand out, but overall they fit in and work as exemplars of their communities. The distinctiveness hypothesis is that popular people are distinctive within their communities. They might have some typical characteristics, but overall they stand out and aren't typical. It's also possible, of course, that there's no strong relationship in either direction between popularity and representativeness/distinctiveness. If you've been paying attention to these charts as much as I have, then you might have noticed something peculiar. The very same traits that are overrepresented in our community, such as Depression and Anger, are also the ones that correlate most negatively with popularity. The opposite is true, too - artsiness for example is (apparently) rare in SUPPicipants but also a great predictor of popularity. 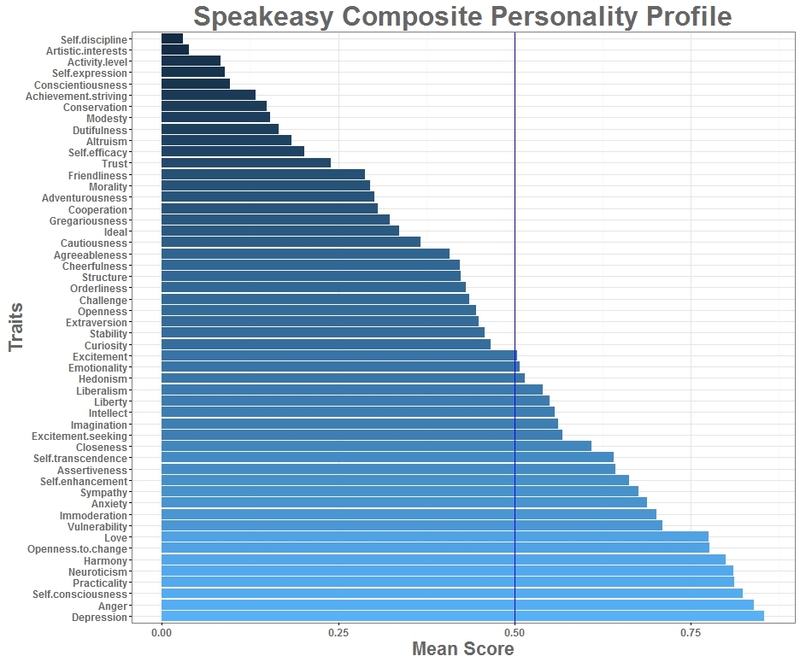 I did the analysis, and at least in the Speakeasy, the distinctiveness hypothesis seems to strongly win out. 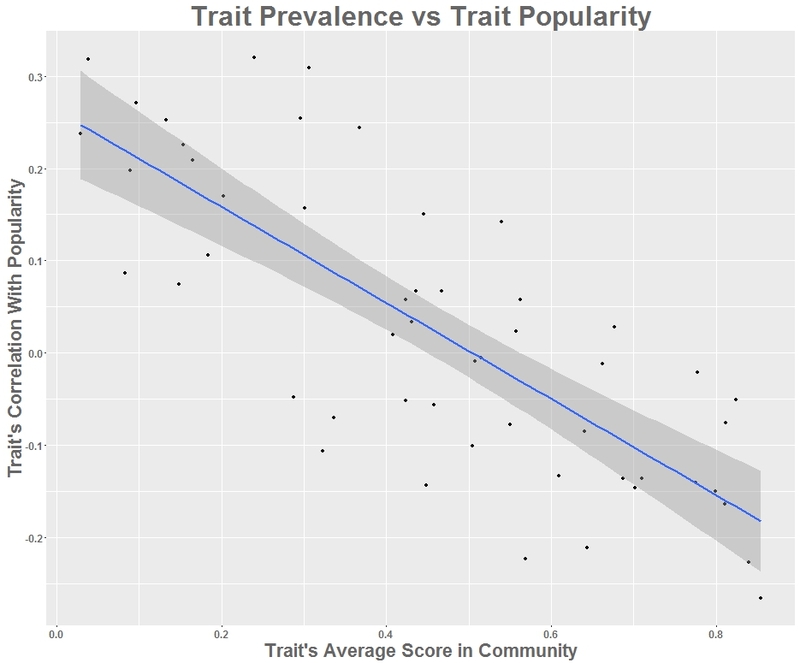 As this figure illustrates, trait prevalence has a -.7782 correlation with trait popularity (p = 1.122e-11). 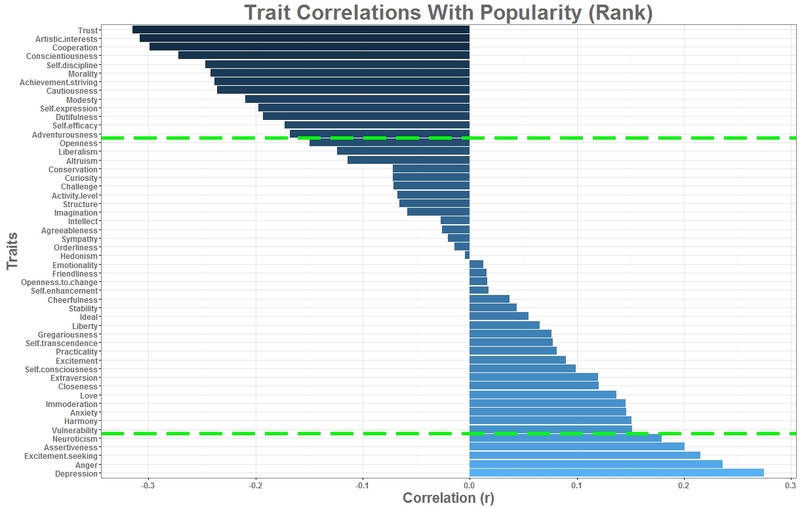 For reference, the strongest correlation I found between a single trait and popularity was a little over .3. Unless I did something wrong, what this means is that the popular people in our community are also the most distinctive people in our community; they have traits that happen to be rare in our neck of the woods. This is probably the most important as well as the strongest finding of my study. But maybe I did something wrong. Last edited by Psyche on Sun Jun 26, 2016 5:37 pm, edited 2 times in total. Group profiles. I will be reporting early a composite profile of participants in the SUPP, but in the future I will probably try to sum up other subsets of the community as well. It'll be easier then to ask more interesting questions about how personality relates with people's place in this community. For example, skittles might be more conscientious than the broader community, even before they become skittles. Scumhunting. I might be able to repurpose the service such that instead of measuring someone's stable personality traits it measures aspects of the particular situation in which data for the profile was produced. In other words, I want to compare profiles of people while they're Mafia with profiles of people while they're Town. There are a lot of ways to do this, and I'm gonna try all of them eventually and see what comes up. Prediction. The analyses I'm doing can be tweaked to make it possible to produce probabilities for future outcomes rather than just describe what's already happened. For example, when the SUPP starts next year I can guess from the patterns I found this year who will do well next year. Similarly, I'll eventually need prediction if I want to use the service to scumhunt. But I'll have to sharpen my stats skills in order to do that. Messing with people. Once I read up more on the personality psychology literature, I should be able to outline strategies/tactics for goal-oriented interactions with other people depending on their profiles. That's not just good for trolling. In a mafia game, personality profiles might predict whether someone will flail under pressure or can be duped through buddying. The literature might motivate hypotheses like these, but actually testing them requires manual scanning through threads that seems sort of tedious to a guy like me. You! A lot of you are really creative and smart people. I bet you'll have better ideas for Beyond than me. I want to field your questions and ideas here in this thread. But beyond that, though, I want even the programming novices among you to know and believe that this stuff I'm doing is easy - even if it IS time-consuming. If I can keep up the time/energy, I'm gonna create guides, apps, packages, whatever that outlines just how straightforward this stuff is so that you can do studies or whatever, too. Also, if any of you wanna team up and work together on this stuff, I'd be...surprised? Ok now that's really that. Last edited by Psyche on Sun Jun 26, 2016 5:37 pm, edited 3 times in total. I think usually when you get the results of these tests you get the disclaimer that it's just a model and that if you think you know something better than the score... you probably do. It's just a convenient way of ordering it and providing a way for someone to discuss it. As such, I'm sorry to say, I fear I don't recognize myself in significant parts of the big 5 scores Sorry psyche, IBM might struggle with the amount of oddities going on here for me: lots of discussions going on on MS, me speaking a foreign language and I suspect also the cultural approach to a conversation I have as baggage, that it couldn't make enough sense out of me. Unless many people encounter this, then maybe MS is at the biggest issue. only don't use my official posts if possible as those are often written somewhat by committee. Last edited by Psyche on Sun Jun 26, 2016 6:59 pm, edited 1 time in total. didn't I sign up for this?